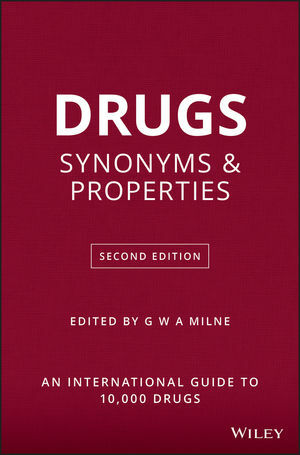 Drugs: Synonyms and Properties provides comprehensive coverage of the 10,000 drugs currently in common use worldwide. Its overall organization and inclusion of detailed chemical information fills an important gap in drug information. This reference, edited by a world-renowned authority in drug design and chemical information and now in its second edition, has become one of the bibles of pharmaceutical research and application. This book organizes the 10,000 drugs currently in use by therapeutic category. Therefore all tranquilizers, all antidepressants, or all anorexic agents, for example, are grouped together. In all, 204 categories are represented. This arrangement means that all drugs in a given category can be reviewed very easily and their relative properties compared quickly. A key component of this reference is the extensive coverage of synonyms. The book includes an index of over 30,000 drug synonyms and trade names with a cross-reference to their main entry. This extraordinarily comprehensive view of trade names and generic synonyms makes Drugs: Synonyms and Properties one of the world's most exhaustive references in its field. For each main entry, the following information is provided: chemical name and a list of trade names and synonyms; the Chemical Abstracts Service (CAS) Registry Number; the European Inventory of Existing Commercial Chemical Substances (EINECS) Number; the Merck Index (Twelfth Edition) Number; the physical properties of each compound; and the known biological activity and indicated applications. Indexes, including a master index of names and synonyms, and of manufacturers and suppliers, are appended. This reference will be invaluable to research chemists, biologists, and physicians and to anyone interested in drugs who, starting with a single synonym for a drug, will be able to quickly find a thumbnail sketch of the essential information concerning that agent. G W A Milne was a Senior Researcher at the National Institutes of Health in Bethesda, MD, USA for 35 years where he worked on the use of spectroscopy for structure determination of organic compounds, and on molecular modeling in the design of drugs for the treatment of cancer and AIDS. From 1980 until 1998 he worked in molecular modeling and information technology at the National Cancer Institute, one of the NIH Institutes. He has been active for many years in the fields of chemical information and chemical computation and is the Editor of the American Chemical Society's Journal of Chemical Information and Computer Science and Gardner's Chemical Synonyms and Trade Names, Eleventh Edition (Ashgate). Part III: Manufacturer and Supplier Directory.